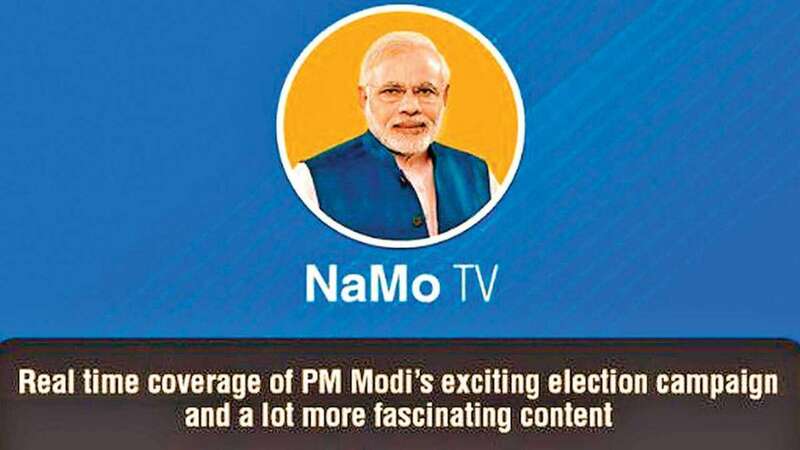 New Delhi : With Lok Sabha elections heading closer, the Bharatiya Janata Party (BJP) has launched a television channel NaMo TV. According to the ruling party, the channel has been named after Prime Minister Narendra Modi to provide real-time coverage of his exciting campaign for the general election. But, it seems that opponent parties like Aam Aadmi Party and the Congress will complain about this new TV channel which will broadcast the live footage of every moment of the Prime Minister’s life spent in public view. “Capture the colours of elections… Watch the dance of democracy…Say NaMo again with NaMo TV,” BJP said in a tweet. Also, PM Modi took to twitter to invite people to connect with him via NaMo TV. PM Modi asked citizens to watch programmes on NaMo TV to get first-hand information about his government. Meanwhile, a question has risen like how can a party-sponsored TV channel broadcasting the party’s Unique Selling Point, violating the model code of conduct. It is known to all that the whole point of an election campaign of different parties is to best influence the voters in their own favour and launching a dedicated television channel is the highest level playing field in election campaign 2019. In this way opposition parties can legitimately demand from the Election Commission is that the expenditure on NaMo TV should be counted as the BJP’s campaign spend. Coming to BJP's NaMo TV, a special event ‘Mai Bhi Chowkidar’ is likely to attract 'Modi Bhakt' to a large extend. “The day we were most looking forward to is here! At 5 PM, lakhs of Chowkidars from different parts of India will interact in the historic #MainBhiChowkidar programme. This is an interaction you must not miss. Watch it live on the NaMoApp or NaMo TV,” Modi said. The channel will live broadcast the rallies PM Modi. It will also telecast his election speeches. Interestingly, the channel logo has Narendra Modi’s picture on it. Apart from running live broadcast of Modi’s rallies, the channel will also stream compilations of his speeches ahead of Lok Sabha elections. Namo TV also runs a scroll at the bottom where viewers can read parts of his speeches. The advertisements on the channels are about the various policies and schemes launched by the government during its tenure. Where can you watch Namo TV? Namo TV is available on major DTH platforms including Airtel, Tata Sky, DishTV among others.